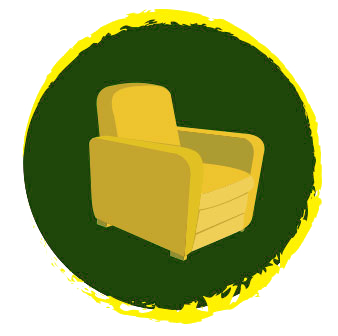 After all, if you buy your furniture off craigslist, we highly recommened that you clean your furniture, as you don’t know what has spilled on those cushions! 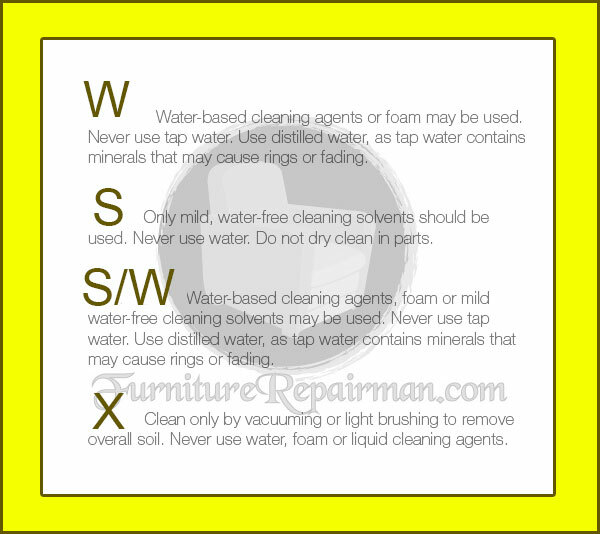 The cleaning codes listed below are usually found on a tag attached to your furniture. The most common place for this tag is under the couch or chair cushions. If they are not removable cushions, than the tag may be found undernath your furniture. 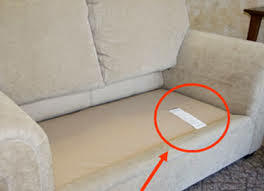 Be sure to check on all the tags that are attached to your upholstered furniture. If for some reason, you still cannot find the cleaning code for your furniture, you might want to to check the manufacturers website or even google it. If you still can’t find it, try calling a professional upholsterer or bringing a swatch of the fabric (cut from underneath your couch) to a fabric store to see if they can help you identify the fabric. If there’s a “W” on your furniture, be thankful, as the W stands for water and is typically the easiest to clean. With a ‘W’ Cleaning code, you should be ok to clean your furniture with an upholstery/carpet cleaner (best to use the attachments) on the stain or spot. This is typically the most durable fabric and isideal for furniture that might see a lot of use or is likely to be spilled on( living room couches and chairs, dining room chairs, loveseats). An “S” cleaning code on your furniture means that it MUST BE cleaned with upholstery dry cleaning solution (S is for solvent i.e. dry clean only) This fabric typically does not respond well to water and should not be cleaned with water. If you clean ‘S’ cleaning code furniture with water you may lose color, or have water rings on your cushions. Furniture spot cleaning is suggested using a dry cleaning solvent intended for home dry cleaning. TIP! Dry the cleaning solvent with a hair dryer to avoid leaving a ring!) Do not allow your piece to become outlandishly dirty if you plan on being happy with the professional cleaning results you will get. Stains, spills or dirt on this kind of furniture should be cleaned as soon as possible to maintain the life of the fabric and keep the colors looking vibrant. S/W cleaning code means a mixture of water and/or dry cleaning solution may be used. This code is uncommon and should probably be left to the professional upholstery cleaners to clean furniture with an S/W code.If you can’t afford a professional furniture technician, furniture with an S/W cleaning code should be used only light traffic living areas and you should always clean stains as soon as possible and before they set. Though it says solvent or water, we belive it is better to use a solvent furniture cleaner if you you can. A rarer cleaning code, X means the item is NOT cleanable with any liquid solution and should be vacuumed. No exceptions. Check with FurnitureRepairman or your local furniture professional on the best methods to clean a piece of furniture with an X cleaning code.